The following procedures should be observed to ensure safe driving. With the brake pedal depressed, shift the shift lever to “D”. Gradually release the brake pedal and gently push the accelerator pedal to accelerate the vehicle. With the shift lever in “D”, push the brake pedal. When the vehicle is stopped for an extended period of time, shift the shift lever to “P” or “N”. When parking on a hill, if necessary, block the wheels. Press the “ENGINE START STOP” switch to stop the engine. Firmly set the parking brake and shift the shift lever to “D”. Drive carefully when it is raining, because visibility will be reduced, the windows may become fogged-up, and the road will be slippery. Drive carefully when it starts to rain, because the road surface will be especially slippery. Refrain from high speeds when driving on an expressway in the rain, because there may be a layer of water between the tires and the road surface, preventing the steering and brakes from operating properly. In the following conditions, the engine speed may become high while driving. This is due to automatic up-shifting control or down-shifting implementation to meet driving conditions. It does not indicate sudden acceleration. For the first 200 miles (300 km): Avoid sudden stops. For the first 500 miles (800 km): Do not tow a trailer. Do not drive at extremely high speeds. Do not drive continuously in the low gears. Do not drive at a constant speed for extended periods. Your vehicle has a drum-in-disc type parking brake system. This type of brake system needs bedding-down of the brake shoes periodically or whenever the parking brake shoes and/or drums are replaced. Have your Toyota dealer perform the bedding down operation. Comply with the relevant vehicle registration laws and confirm the availability of the correct fuel. 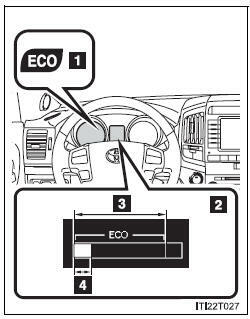 Eco Driving Indicator Light During Eco-friendly acceleration (Eco driving), Eco Driving Indicator Light will turn on. Eco Driving Indicator Zone Display Suggests Zone of Eco driving with current Eco driving ratio based on acceleration. Eco driving ratio based on acceleration If the vehicle exceeds Zone of Eco driving, the right side of Eco Driving Indicator Zone Display will blink and Eco Driving Indicator Light will turn off. The shift lever is in anything other than “D”. The vehicle is set to second start mode or power mode. The vehicle speed is approximately 81 mph (130 km/h) or higher. The Crawl Control is operating. Emission system operating sounds may continue for a short time after the engine is turned off. This is not a malfunction, and helps to ensure optimal performance of the emission system. Always keep your foot on the brake pedal while stopped with the engine running. This prevents the vehicle from creeping. Do not drive if you are unfamiliar with the location of the brake and accelerator pedals to avoid depressing the wrong pedal. Accidentally depressing the accelerator pedal instead of the brake pedal will result in sudden acceleration that may lead to an accident that could result in death or serious injury. When backing up, you may twist your body around, leading to a difficulty in operating the pedals. Make sure to operate the pedals properly. Make sure to keep a correct driving posture even when moving the vehicle only slightly, allowing you to depress the brake and accelerator pedals properly. Depress the brake pedal using your right foot. Depressing the brake pedal using your left foot may delay response in an emergency, resulting in an accident. Do not drive the vehicle over or stop the vehicle near flammable materials. The exhaust system and exhaust gases can be extremely hot. This may cause a fire if there is any flammable material nearby. Do not let the vehicle roll backwards while the shift lever is in a driving position, or roll forward while the shift lever is in “R”. Doing so may cause the engine to stall and lead to poor steering performance, resulting in an accident or damage to the vehicle. If the smell of exhaust is noticed inside the vehicle, open the windows and check that the back door is closed. Large amounts of exhaust in the vehicle can cause driver drowsiness and an accident, resulting in death or a serious health hazard. Have the vehicle inspected by your Toyota dealer immediately. Do not shift the shift lever to “P” while the vehicle is moving. Doing so can damage the transmission and may result in a loss of vehicle control. Do not shift the shift lever to “R” while the vehicle is moving forward. Do not shift the shift lever to “D” while the vehicle is moving backward. Moving the shift lever to “N” while the vehicle is moving will disengage the engine from the transmission. Engine braking is not available when “N” is selected. During normal driving, do not turn off the engine. Turning the engine off while driving will not cause loss of steering or braking control, but the power assist to these systems will be lost. This will make it more difficult to steer and brake, so you should pull over and stop the vehicle as soon as it is safe to do so. Use engine braking (downshift) to maintain a safe speed when driving down a steep hill. Using the brakes continuously may cause the brakes to overheat and lose effectiveness. When stopped on an inclined surface, use the brake pedal and parking brake to prevent the vehicle from rolling backward or forward and causing an accident. Do not adjust the position of the steering wheel, the seat, or the inside or outside rear view mirrors while driving. Doing so may result in a loss of vehicle control that can cause accidents that may result in death or serious injury. Always check that all passengers’ arms, heads or other parts of their bodies are not outside the vehicle, as this may result in death or serious injury. Do not drive in excess of the speed limit. Even if the legal speed limit permits it, do not drive over 85 mph (140 km/h) unless your vehicle has highspeed capability tires. Driving over 85 mph (140 km/h) may result in tire failure, loss of control and possible injury. Be sure to consult a tire dealer to determine whether the tires on your vehicle are high-speed capability tires or not before driving at such speeds. Sudden braking, acceleration and steering may cause tire slippage and reduce your ability to control the vehicle, resulting in an accident. Sudden acceleration, engine braking due to shift changing, or changes in engine speed could cause the vehicle to skid, resulting in an accident. After driving through a puddle, lightly depress the brake pedal to make sure that the brakes are functioning properly. Wet brake pads may prevent the brakes from functioning properly. If the brakes on only one side are wet and not functioning properly, steering control may be affected, resulting in an accident. This may lead to unexpected rapid acceleration of the vehicle that may cause an accident and result in death or serious injury. Have your Toyota dealer check and replace the brake pads as soon as possible. Rotor damage may result if the pads are not replaced when needed. It is dangerous to drive the vehicle when the wear limits of the brake pads and/or those of the rotors are exceeded. If the vehicle is in any gear other than “P” or “N”, the vehicle may accelerate suddenly and unexpectedly, and may cause an accident. Do not leave the vehicle with the engine running for a long time. If such a situation cannot be avoided, park the vehicle in an open space and check that exhaust fumes do not enter the vehicle interior. In order to prevent accidents due to the vehicle rolling away, always keep depressing the brake pedal while the engine is running, and apply the parking brake as necessary. If the vehicle is stopped on an incline, in order to prevent accidents caused by the vehicle rolling forward or backward, always depress the brake pedal and securely apply the parking brake as needed. Avoid revving or racing the engine.Running the engine at high speed while the vehicle is stopped may cause the exhaust system to overheat, which could result in a fire if combustible material is nearby. Do not leave glasses, cigarette lighters, spray cans, or soft drink cans in the vehicle when it is in the sun. Gas may leak from a cigarette lighter or spray can, and may lead to a fire. The temperature inside the vehicle may cause the plastic lenses and plastic material of eye glasses to deform or crack. Soft drink cans may fracture, causing the contents to spray over the interior of the vehicle, and may also cause a short circuit in the vehicle’s electrical components. Always apply the parking brake, shift the shift lever to “P”, stop the engine and lock the vehicle. Do not leave the vehicle unattended while the engine is running. If the shift lever is moved before the low speed four-wheel drive indicator turns on/off, the transfer mode may not be shifted completely. The transfer mode disengages both the front and rear driveshafts from the powertrain and allows the vehicle to move regardless of the shift position. (At this time, the indicator blinks and the buzzer sounds.) Therefore, the vehicle is free to roll even if the automatic transmission is in “P”. You or someone else could be seriously injured. You must complete the shifting of the transfer mode. Do not touch the exhaust pipe while the engine is running or immediately after turning the engine off. Doing so may cause burns. Do not leave the engine running in an area with snow build-up, or where it is snowing. If snowbanks build up around the vehicle while the engine is running, exhaust gases may collect and enter the vehicle. This may lead to death or a serious health hazard. Exhaust gases include harmful carbon monoxide (CO) that is colorless and odorless. Inhaling exhaust gases may lead to death or a serious health hazard. If the vehicle is in a poorly ventilated area, stop the engine. In a closed area, such as a garage, exhaust gases may collect and enter the vehicle. This may lead to death or a serious health hazard. The exhaust should be checked occasionally. If there is a hole or crack caused by corrosion, damage to a joint or abnormal exhaust noise, be sure to have the vehicle inspected and repaired by your Toyota dealer. Failure to do so may allow exhaust gases to enter the vehicle, resulting in death or a serious health hazard. Always turn the engine off. Otherwise, you may accidentally move the shift lever or depress the accelerator pedal, which could cause an accident or fire due to engine overheating. Additionally, if the vehicle is parked in a poorly ventilated area, exhaust gases may collect and enter the vehicle, leading to death or a serious health hazard. When the brakes are wet, drive more cautiously. If the power brake assist function does not operate, do not follow other vehicles closely and avoid hills or sharp turns that require braking. In this case, braking is still possible, but the brake pedal should be depressed more firmly than usual. Also, the braking distance will increase. Have your brakes fixed immediately. Do not pump the brake pedal if the engine stalls. Each push on the brake pedal uses up the reserve for the power-assisted brakes. The brake system consists of 2 individual hydraulic systems: if one of the systems fails, the other will still operate. In this case, the brake pedal should be depressed more firmly than usual and the braking distance will increase. Do not depress the accelerator and brake pedals at the same time during driving, as this may restrain driving torque. Do not use the accelerator pedal or depress accelerator and brake pedals together to hold the vehicle on a hill. Always put the shift lever in “P”. Failure to do so may cause the vehicle to move or the vehicle may accelerate suddenly if the accelerator pedal is accidentally depressed. Do not turn the steering wheel fully in either direction and hold it there for a long time. Doing so may damage the power steering pump. When driving over bumps in the road, drive as slowly as possible to avoid damaging the wheels, underside of the vehicle, etc. A flat or damaged tire may cause the following situations. Hold the steering wheel firmly and gradually press the brake pedal to slow down the vehicle. It may be difficult to control your vehicle. The vehicle will make abnormal sounds. The vehicle will behave abnormally. Replace a flat tire with a new one. Do not drive on a road that has flooded after heavy rain etc. Doing so may cause the following serious damage to the vehicle. In the event that you drive on a flooded road and the vehicle is flooded, be sure to have your Toyota dealer check the following. Changes in quantity and quality of oil and fluid used for the engine, transmission, transfer, differentials, etc. Lubricant condition for the propeller shaft, bearings and suspension joints (where possible) and the function of all joints, bearings, etc.